The idea of incentivizing actions in mobile apps has been around for a little while, most notably through Tapjoy, which lets users win virtual currency in exchange for downloading an app, watching an ad or filling out a form. Kiip, a monetization platform, has innovated on the idea of rewards, offering users branded gifts when they reach certain in-game milestones. But a new startup is trying to take the idea of incentives and real-world rewards one step further by creating a rewards platform that incentivizes all kinds of engagement in apps with the goal of helping developers ultimately do more in-app transactions. Gimmie lets developers reward its users for a variety of actions without forcing them to leave the app, one of the friction points for other incentivized programs. Users can earn Gimmie points for reaching new levels in a game, buying virtual goods, signing up for newsletters or reaching other achievements with better rewards available as users progress further into a game. When they are ready, users can visit a marketplace where they can apply their points for free or toward discounted things like phone accessories, T-shirts and shoes. Gimme was started by Roy Liu, a former lead developer for PopCap’s (s erts) Plants vs. Zombies, and CEO David Ng, who came from ChinaCache, a content delivery service in China. Ng told me that the idea for Gimmie is to build an incentive program that encourages people to keep playing regularly and ultimately steers users toward in-app purchases. He said as more developers look to go freemium, it helps to have a tool that keeps users engaged but in a way that doesn’t take them out of their app experience and offers them choices in rewards. Developers are able to integrate Gimme’s SDK within an hour, said Ng, and they can choose what to incentivize and when to message users. Ng said Gimmie can work alongside existing banner ads and even systems like Kiip and Tapjoy, so developers can experiment with it if they want. 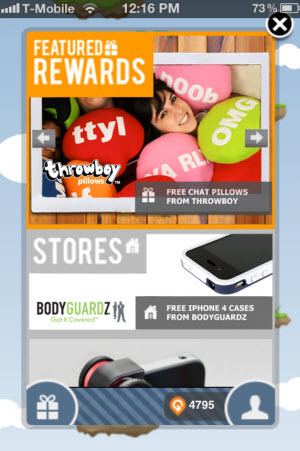 Brand sponsors can also reach out to specific mobile app users with coupons and free products. Gimmie requires users to register through Facebook. That allows brands to incentivize social sharing through additional offers. Some of the initial reward partners include accessory maker BodyGuardz, custom pillow maker Throwboy and other retailers offering T-shirts and shoes. Gimmie has raised $200,000 from Tandem Entrepreneurs, a mobile incubator in San Francisco. It is the second company to launch out of Tandem. I think there are some good ideas at work in Gimmie. As developers move to freemium, they absolutely need to keep users engaged or there will be no way to make money through ads or in-app purchases. That is something app analytics firm Localytics reaffirmed recently in a study. 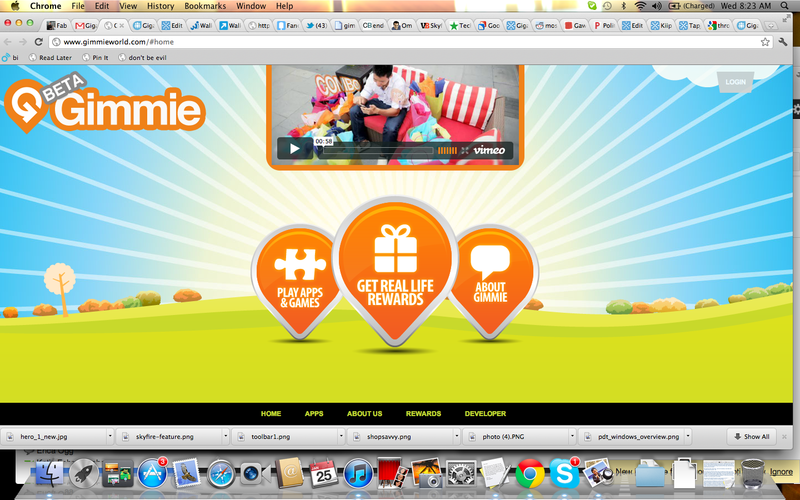 And Gimmie’s approach makes sense, keeping users inside a game or app and letting them choose what they want. If done well, this can help some users stick with a game if the rewards are reachable and appealing. That is going to be a key point: The system will depend on good rewards. And the process of earning points to get them at a discount or ultimately for free needs to be tuned to encourage a lot of use but still seem worth it.